One of the coolest flowers you’ve probably never heard of, Eryngium, known as sea holly, is an up and coming cut flower in the floral design world that will make waves in a surprise bouquet bought and brought for no particular reason. The only thing better than receiving flowers when you least expect it is to find a new and interesting one tucked inside. These long-lasting stems have a shape and texture all their own, so along with the unexpected pleasure of fresh flowers, you’ll be giving them the excitement of discovering something new. Originally native to South America, the sea holly grows wild along the rocky coasts and open grasslands. With a dome-shaped flower ringed by blue frilly bracts, this thistle-like wildflower has an other-worldly quality to it that steals the show next to roses or lilies. 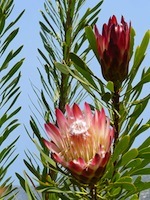 Somewhat spiny and sharp, its non-traditional beauty adds a wild and natural look to any mixed bouquet. The true, cornflower blue of this bloom is hard to find in nature and it pairs wonderfully with tall, blue delphiniums and larkspur and a deep orange Asiatic lily or sunflower. Long-lived and highly suitable as a cut flower, sea holly will be the last stem standing in a vase of flowers. Its strong, spiky stem can handle a lot of handling, which make it a great choice for an outdoor wedding or trimmed up and pinned on as a corsage or boutonniere. It’s a great alternative to daintier flowers for an all-day affair and will look amazing in a wildflower bouquet, both fresh and dried afterwards as a memento. 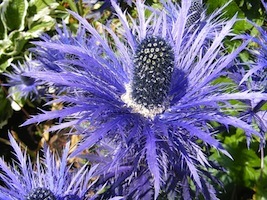 Filled with essential oils, there are over 250 different species of Eryngium. Both edible and medicinal in some cultures, the new hybrids of these sea hollies are finding their way to both florists and gardeners who are attracted to their rich blue and purple color as well as their unique texture. While sea hollies are finding their way into wedding flowers and prom corsages these days, the best way to appreciate their rugged beauty is at a time when one least expects it. While Valentine’s Day blooms and Anniversary blossoms are a wonderful occasion to say it with flowers, the bounty of an unexpected bouquet goes a very long way. Adding just a few stems of sea holly to an otherwise ordinary line-up of flowers will turn any day into an occasion.